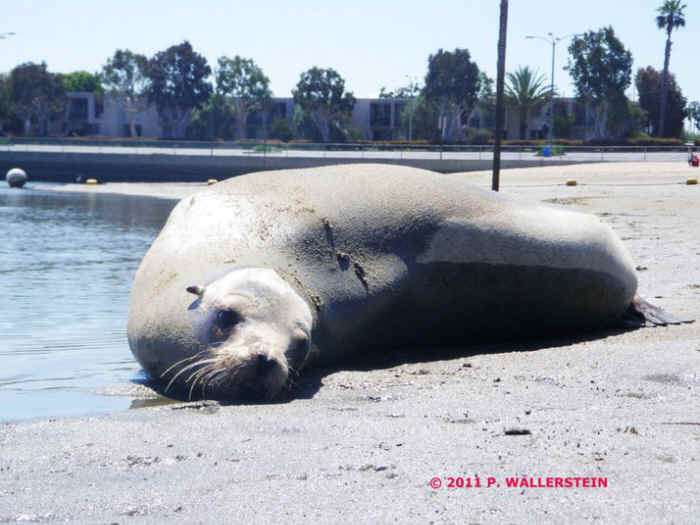 Many of the sea lions were very healthy until they ate the fish loaded with the powerful toxin domoic acid. Although some of the sea lions seemed to be active with good body weight, the fact is, all of them were having seizures on the beach caused by domoic acid just moments before the rescues. These sea lions were very healthy until they ate the fish loaded with the powerful toxin domoic acid. Some of the sea lions are paralyzed when they first arrive on the beach. Others can be very active even with the toxin exploding in their brains. We do are best to rescue them before they go back into the deep water where they could drown while suffering a seizure brought on by domoic acid. We’ve also had at least 8 dolphins, mostly common dolphins strand on the beach this week suffering seizures, again brought on by domoic. None of the dolphins have survived. Many thanks to LA County Lifeguards for assisting with the rescues and crowd control! The most recent rescue is a 10-month old sea lion pup who is suffering from a wound caused by a monofiliment [fishing line] wrapped around his neck.